I would like to implement an algorithm for automatic model selection. I am thinking of doing stepwise regression but anything will do (it has to be based on linear regressions though). add other factors (still based on the low correlation factor found in 2.). reiterate several times until some criterion (e.g AIC) is over a certain threshold or cannot or we can't find a larger value. I realize there is an R implementation for this (stepAIC), but I find the code quite hard to understand. Also I have not been able to find articles describing the stepwise regression. The method yields confidence intervals for effects and predicted values that are falsely narrow; see Altman and Andersen (1989). It gives biased regression coefficients that need shrinkage (the coefficients for remaining variables are too large; see Tibshirani ). Increasing the sample size does not help very much; see Derksen and Keselman (1992). The results of the first race are displayed in the following figure along with the coach's comments to the kids. 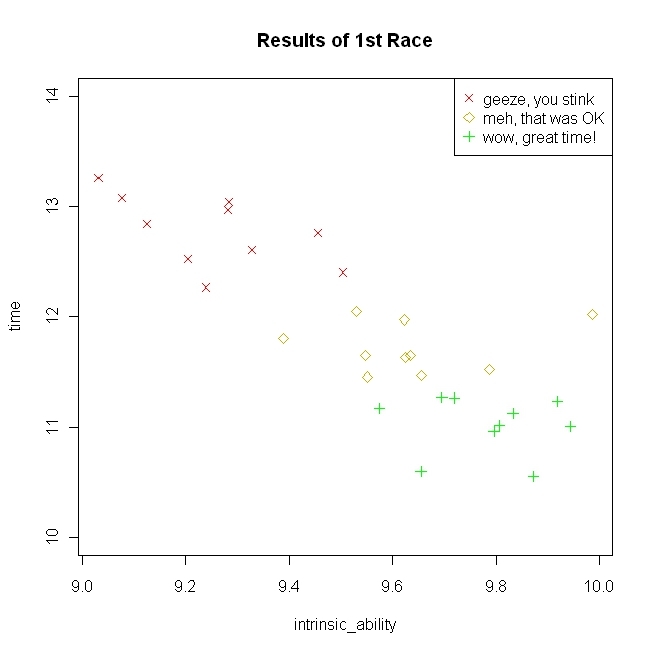 Notice that their intrinsic ability is identical, but the times bounced around relative to the first race. 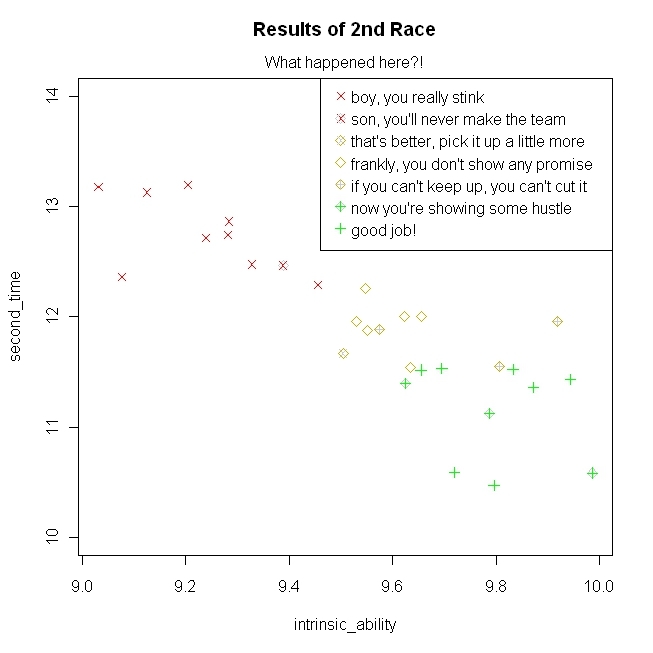 From the coach's point of view, those he yelled at tended to improve, and those he praised tended to do worse (I adapted this concrete example from the Kahneman quote listed on the wiki page), although actually regression to the mean is a simple mathematical consequence of the fact that the coach is selecting athletes for the team based on a measurement that is partly random. Now, what does this have to do with automated (e.g., stepwise) model selection techniques? Developing and confirming a model based on the same dataset is sometimes called data dredging. Although there is some underlying relationship amongst the variables, and stronger relationships are expected to yield stronger scores (e.g., higher t-statistics), these are random variables and the realized values contain error. Thus, when you select variables based on having higher (or lower) realized values, they may be such because of their underlying true value, error, or both. If you proceed in this manner, you will be as surprised as the coach was after the second race. This is true whether you select variables based on having high t-statistics, or low intercorrelations. True, using the AIC is better than using p-values, because it penalizes the model for complexity, but the AIC is itself a random variable (if you run a study several times and fit the same model, the AIC will bounce around just like everything else). Unfortunately, this is just a problem intrinsic to the epistemic nature of reality itself. Check out the caret package in R. It will help you cross-validate step-wise regression models (use method='lmStepAIC' or method='glmStepAIC'), and might help you understand how these sorts of models tend to have poor predictive performance. Furthermore, you can use the findCorrelation function in caret to identify and eliminate collinear variables, and the rfe function in caret to eliminate variables with a low t-statistic (use rfeControl=rfeControl(functions=lmFuncs)). However, as mentioned in the previous answers, these methods of variable selection are likely to get you in trouble, particularly if you do them iteratively. Make absolutely certain you evaluate your performance on a COMPLETELY held-out test set. Don't even look at the test set until you are happy with your algorithm! Finally, it might be better (and simpler) to use predictive model with "built-in" feature selection, such as ridge regression, the lasso, or the elastic net. Specifically, try the method=glmnet argument for caret, and compare the cross-validated accuracy of that model to the method=lmStepAIC argument. My guess is that the former will give you much higher out-of-sample accuracy, and you don't have to worry about implementing and validating your custom variable selection algorithm. I fully concur with the problems outlined by @gung. That said, realistically speaking, model selection is a real problem in need of a real solution. Here's something I would use in practice. Split your data into training, validation, and test sets. Train models on your training set. Measure model performance on the validation set using a metric such as prediction RMSE, and choose the model with the lowest prediction error. Devise new models as necessary, repeat steps 2-3. Report how well the model performs on the test set. For an example of the use of this method in the real world, I believe that it was used in the Netflix Prize competition. Next question would be which method is better. This paper (doi:10.1016/j.amc.2013.05.016) indicates “all possible regression” gave the same results to their proposed new method and stepwise is worse. A simple GA is between them. This paper (DOI:10.1080/10618600.1998.10474784) compares penalized regression (Bridge, Lasso etc) with “leaps-and-bounds” (seems an exhaustive search algorithm but quicker) and also found “the bridge model agrees with the best model from the subset selection by the leaps and bounds method”. This paper (doi:10.1186/1471-2105-15-88) shows GA is better than LASSO. This paper (DOI:10.1198/jcgs.2009.06164) proposed a method - essentially an all-subset (based on BIC) approach but cleverly reduce the computation time. They demonstrate this method is better than LASSO. Interestingly, this paper (DOI: 10.1111/j.1461-0248.2009.01361.x) shows methods (1)-(3) produce similar performance. So overall the results are mixed but I got an impression that GA seems very good although stepwise may not be too bad and it is quick. As for 7), the use of non-automatic, theory ("subject matter knowledge") oriented selection. It is time consuming and it is not necessarily better than automatic method. In fact in time-series literature, it is well established that automated method (especially commercial software) outperforms human experts "by a substantial margin" (doi:10.1016/S0169-2070(01)00119-4, page561 e.g. selecting various exponential smoothing and ARIMA models). Here's an answer out of left field- instead of using linear regression, use a regression tree (rpart package). This is suitable for automatic model selection because with a little work you can automate the selection of cp, the parameter used to avoid over-fitting. linear model can be optimised by implementing genetic algorithm in the way of choosing most valuable independant variables. The variables are represented as genes in the algorithm, and the best chromosome (set of genes) are then being selected after crossover, mutation etc. operators. It is based on natural selection - then best 'generation' may survive, in other words, the algorithm optimises estimation function that depends on the particular model. We do have a function in the R base stats package, called step(), which does, forward, backward or stepwise selection of models based on lowest AIC. This also works for factor variables. Does this not server the purpose here?. with the order given in 2., try to add the factors one by one to the model, and keep them when they improve our criterion. iterate for all the factors. Again, this is very rough, there may be ways to improve the methodology, but that is my starting point. I am posting this answer hoping it can be useful for someone else. Comments are welcome! Not the answer you're looking for? Browse other questions tagged references feature-selection model-selection aic stepwise-regression or ask your own question. How to choose predictor variables for GLM / GLMM from rather large data set? Is it possible to change a hypothesis to match observed data (aka fishing expedition) and avoid an increase in Type I errors? When does AIC lose its power to discriminate models? What exactly is “stepwise model selection”? How to interpret the output from an all-subsets regression? Stepwise AIC - Does there exist controversy surrounding this topic?